Dia de los Muertos meaning the Day of the Dead, it’s a holiday strongly associated with Mexico. 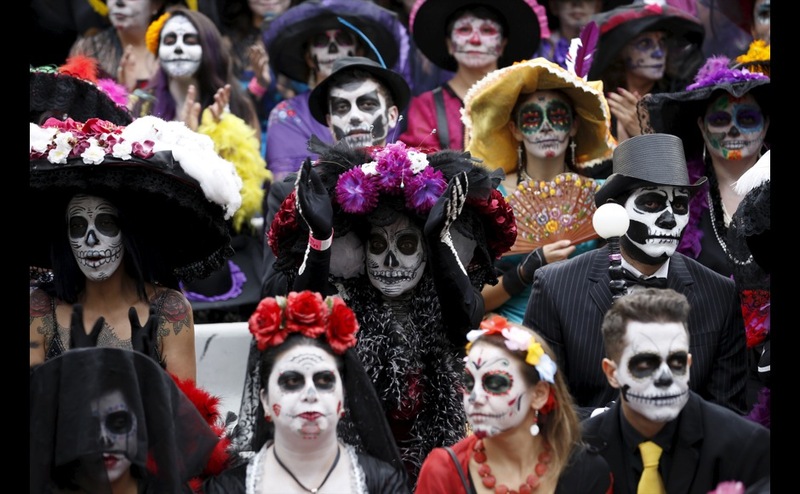 In Mexico they honor their deceased loved ones with festivals that usually start October 31st to November 2nd. The name of the festival may have you thinking that it’s a sad time for all the people and their won’t be much colors, but it is quite the opposite it’s full of smiles, sharing good funny moments with one another, and it’s how they cope with gone loved ones.It was considered an insult to the deceased loved ones to mourn them or be sad so, instead they celebrated their lives by decorating the grave site using marigold because it leads the departed back to their home and the scent is said to attract them as well. ​ Another way to celebrate the departed is to bring the deceased favorite food, drink, and flowers to the altar. A lot of people will get dressed up and paint their face to look more like skeletons with cool designs or only paint half of their face it’s their preference. Crafts are also a big part of the festival they make paper mache skeletons from small to big or skull candies that are sweet. It's definitely a new experience and if you get the chance you should check it out in person! Day of the day is a huge deal in Mexico and attract a lot of people who come to Mexico City for the experience. There are a lot of people who enjoy and want to participate in the festival. There are millions of artists in the world and, sadly, many go unnoticed, but there are a few that get lucky. Sage Addington, a senior at Gallup High, was one of the lucky artists that got featured in Art123 Gallery this past weekend. As a highschool student, I can imagine it is quite hard for to find galleries to feature some of her work. Many were very proud of Sage and her accomplishments. This week I had a chance to sit and talk to her about her accomplishments. Question: How does it feel to be featured in a gallery? Addington: It feels surreal to me. Question: How do people react to your art? Addington: I saw people squinting because my art is very, very tiny. I actually had the smallest art in the gallery. Question: What advice would you give others who want to get their work into the gallery? Addington: Hang out downtown as much as possible because all the shops have posters advertising the themes for the art gallery and that's how I found out they were doing a mini/mega show. Question: Out of all the paintings you had featured in the gallery, which painting was your favorite? Addington: Probably the peach pit. Question: What art do you most identify with? Addington: Unfortunately, I don't know if I even have a style. Question: Does your life affect your art? Addington: Yeah, it does. Two of the paintings I had in the gallery was actually of my childhood home, which is my grandparents home. As you can see, Sage Addington is very passionate about art. She cares about what she does, as well as, how her art is presented to the world. Sage is a talented young lady who will go far in life with her art. Oh, boy I feel arrogant having done this piece, but I wanted to let you guys in on some of the technicalities behind displaying your art in a gallery. Death Note is a story about a kid named Light Turner that comes in possession of a Death Note. A Death Note is a supernatural weapon that can kill anyone, granted the user needs to know their name and face. Light uses his Death Note to try to change the world for the better, but in doing so he attracts the attention of a detective by the name of L. Watch the battle between the two unfold as they both try to find the other's identity. ​ Now if you know anything about Death Note, it's probably because you watched the popular anime by the same name. If you went in this movie expecting to find the same story, then you will be severely disappointed. This movie has little to nothing in common with the source material. The only thing similar is the core concept. For example they changed the characters personalities completely; the characters that are loved by fans are now completely different. They changed Light from this genius that always has a plan, to a whining brat. The detective known as L is almost completely different as well. The always cool and collective detective is now an irrational baby. If it wasn't for the name you'd be asking yourself who is this guy. But that wouldn't be a problem if the movie could stand on it own, unfortunately it cannot. Between the bad acting, the unnecessary gore, and the plot holes, this movie is just aggravating to watch, especially if you were a fan of the anime. I feel like if Netflix took the time to make their remake into a show, then it would have been way better. Overall this movie has bad pacing, plot holes, and a disappointing story. Nowadays artists aren't appreciated the way the should be. Art takes time and effort, but most non-artists don't understand the process that artists go through to create the art that they do. Most artists go through a lot to finish a work. They spend money to get the exact supplies that they need and making sure that every detail is just right. This week for Artist Appreciation I interviewed Kiana Jones. Question: Why do you draw? Jones: It's fun. It helps me relax. Question: Does anything influence your drawings? Emotions? People? Media? Jones: I guess if I feel kinda sad, or I'm listening to something sad it [her artwork] kinda turns out sad. Question: What supplies do you use the most? Jones: Pencils and scratch papers. Question: What is the hardest part of drawing? Jones: For me it’s following through after messing up. Even though, this interview was short, Kiana Jones had quite a bit to say about what she does. She does not want to be artist, but she still likes art. It’s fun and helps her relieve stress and helps her stay calm when she is nervous. Last week we asked Ambush! Readers if they think Columbus Day should be celebrated and 75% of poll takers said no while 25% said they were indifferent.